Here is another new mobile phone photograph. This is a tree with one of the most unusual root systems you will ever see. 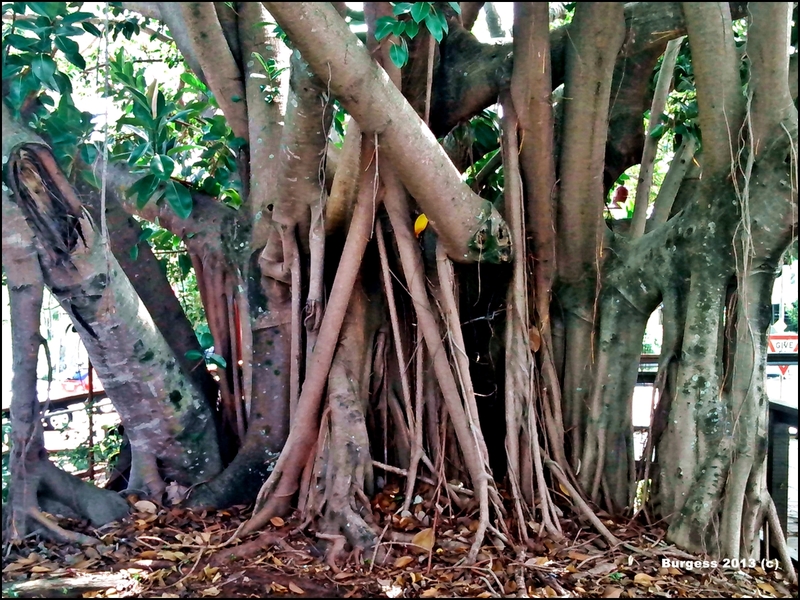 The Moreton Bay Fig, is a large evergreen tree that is a native of most of the eastern coast of Australia. Its common name is derived from Moreton Bay in Queensland, Australia and is best known for its complex and beautiful buttress root system. ……just had to share it with you. ← Mobiles Phones Can Take Photos Too! Great subject and super photo! I am blessed to view a row of these giants of nature every Friday when I attend our Farmer’s Market. My young boys play under them, climb over their roots and generally “hug” them as only adults dream of doing again. And the adults in the community sit and watch and are often caught mesmerised by their beauty and grandeur. I’m really enjoying sharing those moments between you, your phone and our Earth. It is so good you and your family get to enjoy these wonderful giants. Thanks for the description karla and I hope you can photograph the boys playing one Friday at the Farmer’s Market. We have Moreton Bay Fig Trees all over the Los Angeles area, imported from Australia over 100 years ago. Although it’s a different climate, they have thrived. But I’ve never seen one in this area with a root system quite like that! I was always amazed to see huge Australian Gum (Eucalyptus) Trees in L A. They are everywhere too. Love LA…….always stop-over on way to New York. I think if anybody can…….. you can John!